My oldest son is almost five years old. He loves being read to however he has no interest in attempting to read aloud. But, he is a reader! Every night he has his flashlight and at least three picture books that he goes through page by page before he goes to bed. If you listen closely, you can probably hear him talking to himself about the pictures he sees on each page. Some would argue with me and say that he is not reading because he is not calling out the words on each page. I am not very good at debating, so I would just pull out the quote I found from Bob Staake, "The way I read as a kid is I would flip through Esquire magazine or National Geographic Magazine, and I would fixate on whatever caught my attention, a photograph, an illustration, or an ad. That was reading to me. That is the way kids start to read, and parents don't respect it enough. The idea that looking at things is not as important as reading the written word, that's BS." (Boston.com). Bob Staake has published over 50 books including The Donut Chef, Hello Robots, and The Red Lemon (a few our family's favorites) and has been described as one of the "nation's most successful illustrators." His artwork has been seen on the covers of The New Yorker magazine, advertisements for large corporations, product packaging, greeting cards, and newspaper cartoons. He even, "designed fake commercials for The Ren and Stimpy Show, designed 8 episodes of Dexter's Laboratory, and created the characters for PowerPuff Girls." (Little Chimp Society). He creates his illustration using "a mouse, a keyboard, and an antiquated version of Adobe Photoshop (video below)." He described his process in an interview by Christopher Seufert on YouTube, "I just tend to work very quickly. When I get on a project or on a book, I am not the type of person that wants that protracted deadline. I am always waiting until the final month. I don't want to spread out those illustrations over time. For me to keep cohesiveness and consistency between the illustrations it works best for me to sit down and do it straight out." Last year, I planned on celebrating Bob Staake's birthday with my family. We read all of his books and I had even contacted him well ahead of time to let him know we were celebrating. However, we moved to a new house which proved to be much more overwhelming than I expected. We lacked internet access in the new home for about two weeks which prevented me from posting in time for his birthday. 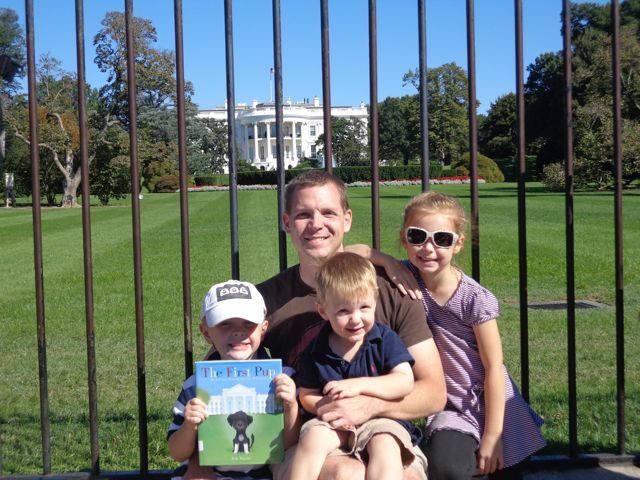 Fast forward to this year, our birthday celebration for Bob Staake was not going to be interrupted by our family trip to Washington D.C. to attend the National Book Festival. 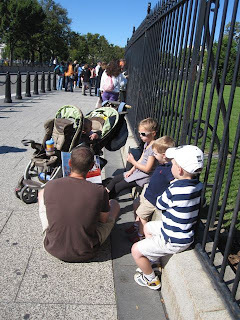 My wife and I were excited and confident to take our children to the National Book Festival, but we were worried about the six hour car trip to the nation's capital from Ohio. We had all the electronic gizmos charged, numerous snacks packed, and countless activities ready. 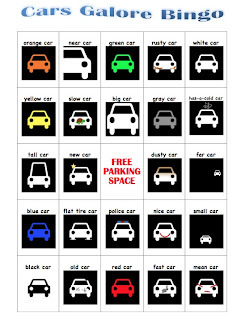 I even made Cars Galore Bingo based on the book by Peter Stein and Bob Staake. We had read this book numerous times and spent a lot of time just looking at all the illustrations. I was sure my game was going to be a hit! My kids were excited about playing the game for only about 10 minutes. I was so glad I spent about two hours making it. Maybe it will keep your kids entertained a little longer than mine! The first activity to celebrate Bob Staake's birthday may not have gone the way I expected, but the second activity exceeded my expectations. Reading The First Pup: The Real Story of How Bo Got to the White House by Bob Staake to my children, right outside the iron fence that surrounds one of the most recognizable buildings in the world, may become one of my most memorable reading experiences with my children. The book starts with the election of Barack Obama as the President of United States. On his victory night, Barack Obama makes two promises -- to work hard for the people of America and to get his daughters, Sasha and Malia, a puppy! My children really enjoyed learning how Bo, an unwanted puppy, made his way from a farm in Texas to the White House. On Bob Staake's website he has a photograph of Barack Obama reading this book! A beautiful day to read a great book! 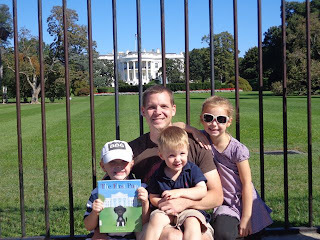 We squeezed our way through all the sightseers to snap this photograph in front of the White House. We moved off to the side so we wouldn't get trampled when I read the book. My kids enjoyed pointing out things they noticed in the book and the area around them. On the last spread, Bob Staake's illustration has Bo peeking his head out of one of the White House windows. We looked to see if he was there, unfortunately he wasn't. We thought he must playing with Sasha and Malia! In an interview with Neatorama, Bob Staake shared a few "things people don't know about me" including, "I was busted for climbing the Lincoln Memorial." Well, I think I have a few Bob Staakes in the making within my family. My daughter was trying to figure out the best way to touch Lincoln's foot and my son was attempting the climb the columns! In closing, I wanted to leave you with another quote by Bob Staake that I don't want to forget, "Read, but if you can't, then LOOK through a book at just the pictures -- and don't feel the need to apologize for only looking at them. We ALL need to look more!" (Thunder Chunky). What a great celebration, Eric! 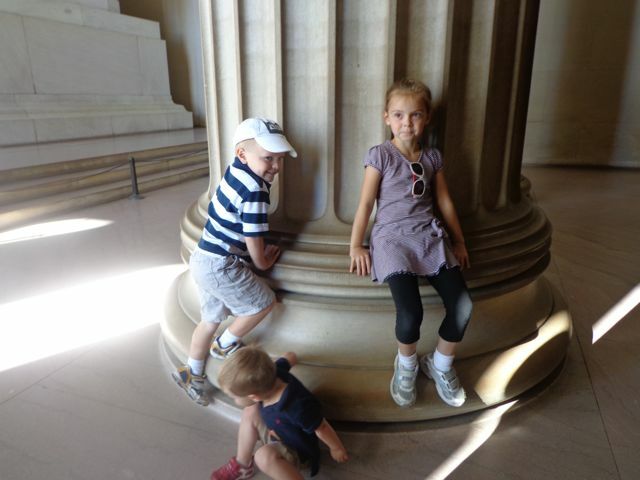 I loved the pics of your family trip to D.C. and am very impressed - I don't know how you do it. You are braver than I. The Bingo game is adorable, and the reading session outside the White House - you are too perfect!!!! I have a couple of these books on my to-buy list on Amazon, and think I will have to go with CARS GALORE for my car-crazy boys. We have Richard Scarry's "things that go" book, but apparently they need MORE! Renee, CARS GALORE is great. Your boys will love looking at all the different types of cars and you will enjoy reading it aloud! D.C. was fabulous. I asked my daughter what she thought about the National Book Festival and she said, "It is nothing like I ever imagined." Reading a book about the White House pup on the sidewalk outside of the actual White House is pretty epic! (As my 15yo would say) What an incredible memory for your whole family. Bob Staake has wonderful ideas about reading and looking. He is 100% correct about respecting the way each kid learns to read. Thank you! EPIC indeed! 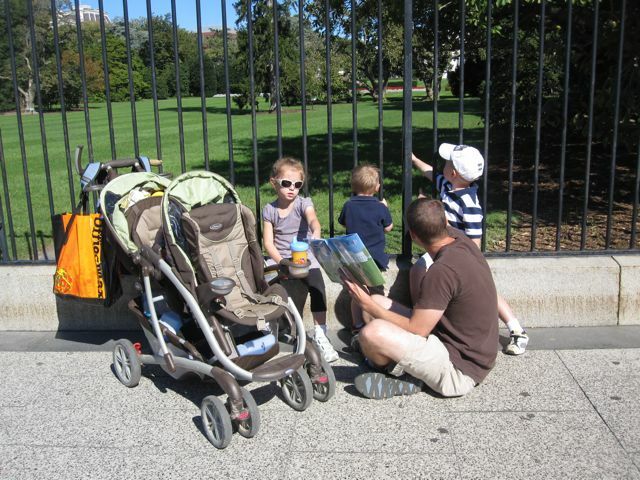 I don't think I will ever forget reading that book in front of the White House. Thanks again for sharing my posts! Wow. You guys have been busy. What a great shot in front of the white house!